Mace is one of the two spices derived from the tree in the genus Myristica. The most commercially used species is the Myristica fragrans, an evergreen tree native to the Banda Islands in the Moluccas (or Spice Islands) of Indonesia. Mace is one of the two spices derived from the tree in the genus Myristica. The most commercially used species is the Myristica fragrans, an evergreen tree native to the Banda Islands in the Moluccas (or Spice Islands) of Indonesia. Nutmeg and mace have similar sensory qualities, with mace having a delicate flavor and nutmeg having a slightly sweeter taste. Mace is often preferred in light dishes for the bright orange, saffron-like hue it conveys. Nutmeg is used for flavoring many dishes, usually in the ground or grated form and is best grated fresh in a nutmeg grater. Here are 7 health benefits of nutmeg. 1. Mace can assist in energy antioxidant defense. Mace possesses a good amount of manganese, which is an essential cofactor in some enzymes important in antioxidant defenses. 2. Mace can assist in red blood cell formation. 3. Mace can help treat insomnia. Mace possesses a high content of magnesium, which reduces nervous tension and even stimulates the release of serotonin, creating a feeling of relaxation or sedation. 4. Mace can freshen your breath. Mace contains antibacterial properties known to treat halitosis or bad breath. Mace can also treat gum problems and toothaches. 5. Mace can help fight brain disorders. Mace contains essential oils like myristicin and macelignan that have been proven to reduce the degradation of neural pathways and cognitive function that commonly affects individuals with either dementia or Alzheimer’s disease. 6. Mace can help individuals with indigestion. The fiber content in mace can stimulate the digestive process, increase the secretion of gastric and intestinal juices, and reduce the frequency and discomfort of constipation. 7. Mace can help treat inflammation. Mace oil has great abilities to treat muscular and joint pains and sores as it is an excellent sedative. It also has anti-inflammatory properties and can be very useful for treating arthritisand rheumatism. Paul, S., Hwang, J. K., Kim, H. Y., Jeon, W. K., Chung, C., & Han, J. S. (2013). Multiple biological properties of macelignan and its pharmacological implications. Archives of pharmacal research, 36(3), 264-272. Ibrahim, K. M., Naem, R. K., & Abd-Sahib, A. S. (2013). Antibacterial activity of nutmeg (Myristica fragrans) seed extracts against some pathogenic bacteria. Journal of Al-Nahrain University, 16, 188-92. Saxena, R., & Patil, P. (2012). Phytochemical Studies on Myristica fragrance Essential Oil. In Biological Forum-An International Journal (Vol. 4, No. 2, pp. 62-64). Burubai, W., Amula, E., Daworiye, P., Suowari, T., & Nimame, P. (2009). 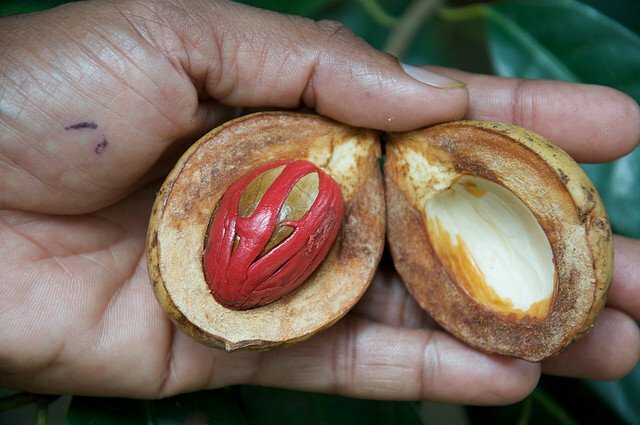 Proximate composition and some technological properties of African nutmeg (Monodora myristica) seeds. Electronic Journal of Environmental, Agricultural and Food Chemistry, 8(5), 396-402. Sa-nguanmoo, P., & Poovorawan, Y. (2007). Myristica fragrans Houtt. methanolic extract induces apoptosis in a human leukemia cell line through SIRT1 mRNA downregulation. J Med Assoc Thai, 90(11), 2422-8. Webbe, J., Duncan, V., Forsyth, V., & Bernard, L. S. (2003). U.S. Patent Application No. 10/655,212.